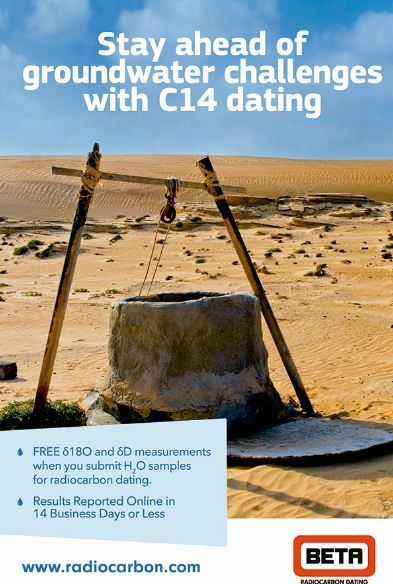 Beta Analytic is expanding its services for groundwater and, for a limited time, is including free additional measurements when clients submit samples for radiocarbon dating. The laboratory is including isotope ratios for deuterium (dD) and oxygen (d18O) at no additional cost for all water samples submitted for accelerator mass spectrometry (AMS) dating until August 2016. The laboratory also reports Carbon-13/Carbon-12 (d13C) values measured separately on the material in an isotope ratio mass spectrometer (IRMS) for every sample sent for Carbon-14 dating. All isotope measurements can also be ordered on a standalone basis without radiocarbon dating for a small fee. Beta Analytic’s ISO/IEC 17025:2005-accredited Carbon-14 analysis of groundwater can be a useful monitoring tool when studying dynamic changes within groundwater systems. Groundwater dating provides information on an aquifer’s recharge rates and whether it is over-pumping and at risk of overexploitation or contamination by surface waters. The laboratory’s expanded services for water samples now allow hydrologists to include dD and d18O values in their studies – isotopes that can provide insights into the source and evaporative history of water or be used as means to trace its movement. Beta Analytic focuses on reporting high-quality lab results and is not involved in the modelling of interpretation of these data. “We are very glad to be able to provide our customers with dD and d18O at no additional cost. We have launched the initiative after updating our IRMS laboratory to include two new systems capable of providing the dD and d18O routinely with the AMS results. We look forward to making useful information more available to the groundwater research community,” Beta President Darden Hood says. Beta Analytic’s enhanced groundwater service reflects its ongoing commitment to providing clients the most comprehensive service at the best price. With prices stable for over a decade, the laboratory continues to pack more value into its world-renowned radiocarbon dating service. Further information on groundwater samples, including sampling and shipping recommendations, can be found in the lab’s web page about radiocarbon dating groundwater. Beta Analytic is a Florida-based laboratory with a global scope. Forwarding offices around the world ensure convenient shipping of samples for clients in Europe, Japan, China, Australia, Brazil, Korea, and Taiwan. Beta Analytic’s global team provides dedicated and comprehensive customer support and technical consultation before, during and after sample submittal at no extra charge. Submitters who have doubts about the suitability of their samples are welcome to contact Beta Analytic’s experts prior to sending samples to take advantage of their expertise. Samples have a standard turnaround time of 14 business days or less and expedited services are available (2-6 business days). All analyses are performed in-house; Beta Analytic does not engage in satellite dating. Results are accessible 24/7 via web and mobile access. The lab is respected worldwide for accuracy and customer care. Why is it important to do all steps of the analyses in one laboratory?Disclaimer: This video is hosted in a third-party site and may contain advertising. Beta Analytic can invoice clients in several currencies including EUR, GBP, JPY, KRW, RMB, TWD and USD. Please indicate the currency in your requests for estimates/quotations. For inquiries, contact a member of the Beta Analytic team. How much does radiocarbon dating cost? This entry was posted on Tuesday, October 20th, 2015 and is filed under Uncategorized .